Tekmap provided multibeam data used in the recently aired special, Drain the Great Lakes. The special aired on the National Geographic Channel and the Discovery Channel. The multibeam data were provided for the segments on the Fathom Five National Marine Park and the bedrock pop-ups. The data were collected by the Canadian Hydrographic Service. The Fathom Five segment features a dramatic section of the Niagara Escarpment. Features along the Escarpment include an ancient riverbed that cascades over the escarpment at two locations as dramatic waterfalls. All of these features are now submerged below the waters of Georgian Bay. 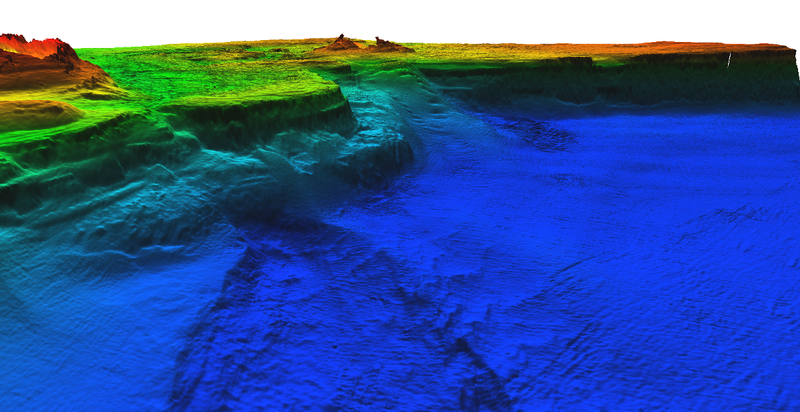 High resolution multibeam data brought these features to life. The Fathom Five multibeam data also reveal ancient features left by glaciation, bedrock pop-ups, and a pristine shipwreck. The multibeam data from Fathom Five Five were collected during multiple surveys from 2001 to 2010. In addition to extracting the bathymetry, Tekmap also processed and mapped the backscatter for the site. The multibeam backscatter provided valuable information about the seafloor characteristics and was used to map the geomorphology of the site. Fly-throughs of the Fathom Five National Marine Park data are featured on Tekmap's Youtube channel. Information on the fly-throughs is available from the Gallery page. The bedrock pop-ups segment in Drain the Great Lakes features multibeam data collected in Lake Ontario, south of Toronto. The depth range of the data shown above is 40 to 100 metres. The pop-up relief is up to 2 metres.